Manipur Governor Dr Najma Heptulla has initiated the Governor’s relief fund for flood victims at Raj Bhavan in Imphal on Friday. 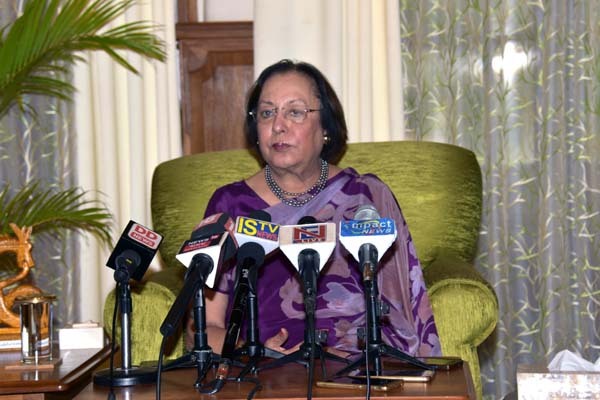 Addressing a press conference at Raj Bhavan on Friday evening, Governor Dr Heptulla announced donation of her one day salary to the Relief fund for flood victims. All the staff of Raj Bhavan will also donate their one day salary to the relief fund. She also appealed to the people of the state to donate whatever they can and contribute items to help flood affected people who are in need. Most of the people in the flood-stricken areas are suffering a lot and there is a possibility of outbreak of diseases even after the flood situation improved, she said expressing the need for taking up appropriate measures by the concerned authorities of the state government to cope with the situation. She informed about her discussion with Chief Minister N Biren Singh on precautionary measures that can be taken up by the government for the flood affected people, she said that the Central government was also aware of the situation. Besides she had even spoken to DoNER minister in this regard, she added. Expressing the need to have a proper plan to reduce harm caused by natural calamities in the state, she said the government must find a permanent solution to avoid floods in future. “Planting trees as much as we can could be a solution to the flooding problems in the state. Afforestation is a must for the state,” she emphasized on the need for putting in place a proper drainage system. Considering the grim situation that affected a large number of people in view of the flood, the Governor informed that Raj Bhavan will not celebrate Id-ul-Fitr tomorrow. However, we have decided to organize Eid on June 19 for the Raj Bhavan and will invite people, she asserted.